While we've covered this all before, I wanted to state that: I'm a geek. And while I might think I'm a big dweeb, I take solace in the fact that I'm not the biggest geek in my office. There are at least two others. One who is a Ph.D. who is "just" a data analyst. A doctorate to do reporting - really? But it is Marty who takes the cake. Years ago, I used to report to Marty. He was the only person I have reported to younger than myself. ...and he's an absolute great guy. He's wicked smart and one of the funniest people I've ever met. ....and I'd never play poker with him because he can weave a tale that is all lies, so he can 'get you' later. Oh, that and the fact I don't know how to play poker. But in the last few weeks, on Fridays, Marty has been bringing in potato chips - multiple kinds of the same flavour. At lunch, he's putting them out on the table and conducting taste-tests. ...for no good reason. It's all very scientific. Only he knows what chips are which brand. Like in the above image, he categorizes them: regular, kettle and 40% less fat. We are to sample all - pick our top choice in each category and then one for overall best. But he tallies them and has graphed them out on a white-board in the lunch area. Really what it does is bring some levity to Fridays and engages the people in the office to participate. For some of us....um....them.....it is something to look forward to. It's a good situation - I can eat chips, but I only eat between 3-7 of them, depending on how many samples Marty brings in. So I'm not eating an entire bag. I'm hoping we move on to ice cream tasting soon. 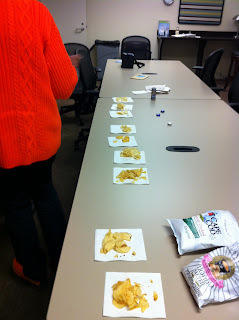 I'm tired of chips - and we're getting dangerously close to having to sample vinegar ones. No. Can. Do. Very cute post, and I think Jason Segel is kind of hot. Geeks will inherit the earth, my middle child is a geek, she regularly gets invited to "praise assemblies" at school and we get letters home saying she is pupil of the term.....again. Sadly she thinks it would be better to be a "popular" than a geek. Have you reached any firm conclusions after all this crisp research? sour cream and onion chips - the best. everything else is blasphemy! What a marvelous fellow to know. Just don't get too fat with all these nibbles. First of all you are a Handsome Geek. Luck to be you tasting all of this. Marty seems very nice and you should be lucky to have a someone like that. I have seen bosses who are not that nice. Whenit comes to the vinegar chips I willbe gladly take your place.